Discover the world of Arizona hot air balloons! Whether you are looking for something special to add to your corporate event, anniversary, birthday, ballooning is the perfect addition that will leave you with a lifetime of memories so make sure to take along your camera so that you can remember the great time you had! There are some very important things that you should read before making your flight reservation. No doubt about it, Arizona has the perfect location for ballooning. With our warm weather, sunny skies and our Sonoran desert, it's no wonder why many love to enjoy this popular 1-day-activity in our desert. Whether you are looking for a gift for that someone who has everything or just looking for an excuse to do something different, then Arizona balloons might just be your answer. You will need to reserve a spot so if you are serious about reserving a flight, make sure you allow plenty of time as these flights tend to fill up pretty quickly, especially in the cooler months when Arizona is known for an abundance of "snowbirds." There is a lot of information out there about the sport of hot air ballooning, so sit back, relax and enjoy! 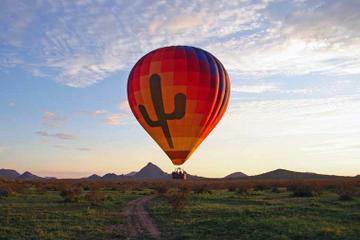 A hot-air balloon ride over Phoenix is an exhilarating experience, whether at sunrise or sunset (seasonal). After your flight, enjoy a champagne breakfast or evening hors d'oeuvres for the perfect start or finish to your day. "A magic carpet ride" and "riding on a cloud" are two phrases that have been used to describe the beauty, exhilaration and gentleness of ballooning. The balloon tour lasts approximately 1 hour with sunrise and sunset (seasonal) flights available. Even though you travel at speeds of five to six miles per hour, there is virtually no sensation of motion because you are flying with the wind. As you gently leave the ground, you'll be amazed at how light the balloon feels. During the flight you will have an unobstructed 360-degree view to take excellent photographs. Flying close to 400 feet above the ground, you will be able to see the magnificent sights and sounds of desert life. Are they safe? This is probably your most important question, if you have never been hot air ballooning, right? Arizona hot air balloons are considered safe, but with any activity or sport, there are no guarantees nothing bad will ever happen. That being said, it will hopefully make you feel a little better, as it did me, knowing that balloon-pilots are required to possess a commercial pilot's license. More specifically, they are required to have a "fixed-wing" license to fly. The best thing to do prior to your flight in an Arizona hot air balloon, is request to see certification. This will help ensure you will have a safe, fun and pleasant ballooning experience. How Do Arizona Hot Air Balloons Work? 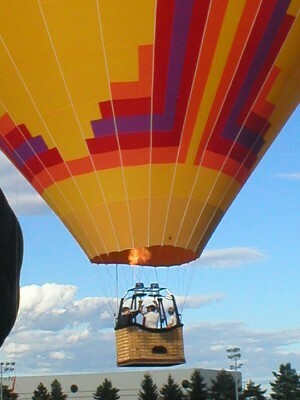 Arizona hot air balloons are able to rise because the air inside the balloon is warmer than the surrounding air. This results in pressure differentials and produces the balloon to be able to lift into the air. And when you reach the upper altitudes.... ahhhh... what an unbelievable view like no other. 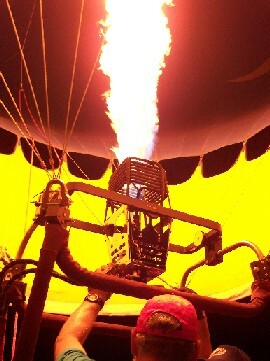 Hot air balloons rise when the burner, which is fueled by propane gas is positioned under an open balloon envelope. This in turn heats the air and makes the balloon rise. When the parachute valve at the top of the envelope is opened, some of that hot air escapes, and the balloon sinks. If you are afraid of heights as I am, this will likely ease your mind....Since you're not attached to the ground, you will not get the feeling that you would if you were standing up on a ladder or something even taller than that. I understand that even if you are afraid of heights, most passengers of these Arizona hot air balloons actually forget about their fear of heights not long after they lift off of the ground. How Long Will I Be Up In The Air? The hot air balloon flight, itself, usually lasts about 45 minutes to an hour. The length of the balloon flight depends on both the wind speed and the direction of the wind on the morning of your flight. One should set aside about a 4-hour block, though, as there are steps before and after the flight. The altitude will vary during your flight. 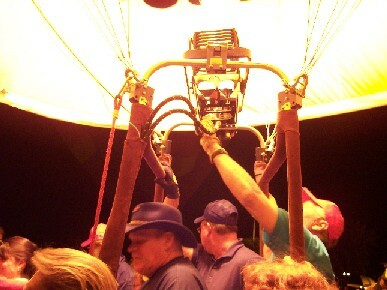 However, most Arizona hot air balloon flights you will be between 1,000 and 3,000 feet up in the air. It is possible for hot air balloons to go higher, that is if the wind on the scheduled day of your flight allows for this. What Items Should I Take With Me During My Arizona Hot Air Balloon Ride? Don't forget to bring your camera! Take your digital camera if you have one. Some companies will video tape your experience as part of their pricing, so be sure to ask. Also be sure to take along some drinking water. Some companies also provide your hot-air-balloon tour with a lunch once you land. How Does The Balloon Get Inflated? What Is A Hot Air Balloon Made Of? 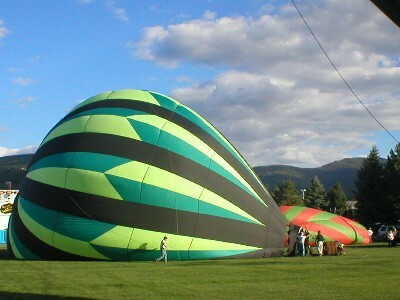 The balloon is often referred to as the "envelope," and is usually made of nylon or polyester. This is the same type of cloth that you will see on parachutes. To me, when I look at the the envelope, it doesn't really look like it is made out of a tough fabric. You can be rest assured that it's much tougher than you might think. The baskets, as you might guess, are made out of wicker. Wicker is considered to be very sturdy and flexible, but yet lightweight. Flexibility in a basket is a big benefit when landing as it is able to absorb some of the energy on impact. The wicker basket prevents the passengers from feeling such a huge jolt when landing! The only way to steer a balloon is by finding different wind directions at different altitudes. Pilots are specifically trained for flying and are extremely skilled at navigating the balloon. The hot air ballooning organization states that the only true way a pilot is able to steer a balloon is by finding different wind directions at different altitudes. Arizona hot air balloons are really dependent on the wind and rides with it, if you will. For the pilot to maneuver the balloon in a certain direction, the pilot ascends and descends in order to locate the appropriate wind direction he/she is looking for. Pilots are also able to contact the weather service for assistance in determining which way the balloon will travel. The hot-air-balloon crew then follow the balloon crew by automobile. How Far Do You Travel During The Hot Air Balloon Flight? Every balloon flight relies solely on the wind; thus, no two balloon flights are ever the same. Although you can never be sure just how many miles you will travel during your hot-air-balloon tour, because of this wind variation, most flights travel between two and five miles. Can I Take The Children On A Hot-Air-Balloon Ride? All the companies I have researched, allow children. You just need to ask and make sure that there isn't an age restriction. Most children around the age of six, will likely enjoy the experience, but some companies discourage a child under six. Usually around the age of six is when a child will be able to see over the hot-air-balloon basket, and when he/she will be able to better enjoy the ballooning experience. Keep in mind that some children are frightened when they hear the loud sound that the hot air balloon burners routinely make throughout the entire flight. How Many People Will The Balloon Basket Hold? Well, that depends on the size of the hot air balloon. Many hot air balloon companies have a wide array of sizes for all numbers of people. I have heard of companies accommodating people up to 50 people as well as others who will even provide a wedding ceremony in flight! I know a couple who got married in a hot air balloon and it was quite a cherished and special event! Why Do I Usually See Balloons Flying At Sunrise Or Sunset? The wind is normally calm during these times, which is an extremely important factor with hot air balloons. Evening flights can be canceled more often than sunrise flights due to the fact that the wind during sunset hours is less predictable than sunrise. Many of the local hotels and resort city/town locations where these rides many times originate, often have a discounted brochure inside of their lobby area, so it would be worth your time to check with either the concierge or lobby area. I know these discounted brochures exist in a local hotel where I live here in Arizona. Some companies here in Arizona may provide rides at a much cheaper rate, but they may not offer some of the other perks that other companies do such as snacks or breakfast, free pickup service at your hotel, champagne, complimentary pictures, or any other added touches to make your flight special. So be sure to ask exactly what you are getting for the price.